The Winter 100 was a new event by Centurion Running and involves 4 x 25 mile out and back legs. The event was scheduled to start from Streatley and run west along the Thames Path to Days Lock and back followed by a second leg heading east along the Thames Path to Reading and back. 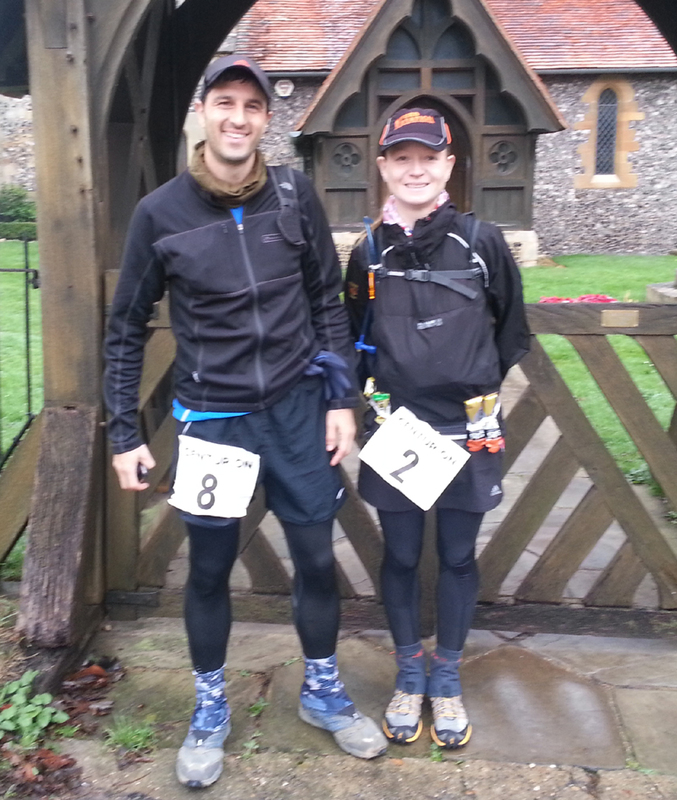 The final two legs would see runners travel north along the Ridgeway and back followed by a southern Ridgeway leg . The pre-race plan had been to aim for a 22 hour finish which would represent a new PB. I had banked a few miles in the build up to the event, had recce’d each leg and had no injury concerns at all. The only downside was that I had completed Ceasars Camp 100 about 5 weeks earlier and was a little uncertain whether this would have an impact during the later stages of the race. I had been hoping to cover the easier first 50 miles in around 9 hours leaving 13 hours for a mid-point stop and the second leg. What could possibly go wrong? I travelled down to the event with fellow club runner Wendy Shaw who was also participating in the event. We registered, went through the kit check and then I said hello to a few people before Race Director James Elson gave the pre-race briefing. Unfortunately, the original course was going to be diverted away from the Thames Path which had flooded and with steady rain predicted for the next 16 hours or so it was only going to get worse. The Centurion team had some contingency plans in place but I’m sure there was a lot of last minute work involved in getting aid stations and volunteers in place and course markings amended. Despite the poor conditions, the team definitely wanted to get the race on as long as this did not impact the safety of the runners. I should also mention that the “Piece of String” fun run event was also taking place at the same time with about 10 hardy runners having set out at mid-night in a race where they were not told of the exact length which was a secret only known to the Race Directors, messrs Elson and Adams. The runners instructions were simply to run to checkpoints until they were told to stop! It was likely that we would see a few of these people on the course. The modified route was going to be 2 x 12.5 mile legs following the Ridgeway and then heading to Wallingford steering away from the Thames Path, followed by the original Leg 3 repeated twice (2 x 25 miles) and then finishing with Leg 4 (1 x 25 miles) I was pretty comfortable with the directions having recce’d the route but knew Leg 3 was probably going to be slower than the original planned route. With the steady downpour, course adjustments and ground conditions I mentally started to revise my initial goals from 22 to 24 hours. Following the weather advice, I wore a base layer, running top and put on my rain jacket and decided to carry a fleece top. All of my backpack contents were wrapped up on sealable plastic bags to keep them dry. I had prepared a small number of food bags which I could access at race HQ with a few favourite snacks and a handful of gels although I had planned to grab snacks at checkpoints aswell. We lined up outside the Morrell Room in Streatley which was the base of operations and set off over the bridge and towards the Ridgeway as the rain started to pour. I started near the back as usual and overtook a few people as I settled into a comfortable pace and ended up running along with Wendy Shaw and Allan Rumbles who was aiming to finish his fourth Centurion 100 miler and earn the coveted Centurion Grand Slam award (a very large belt buckle). This leg was quite runnable as the first mile or so took you over paths and roads from Streatley and then towards the villages of South Stoke and North Stoke and then onto Wallingford. There were a couple of muddy fields along the way but this leg went quite quickly and I was happy to cover as much as I could in the daylight. We ran to the first Checkpoint in Wallingford and passed a few of the “Piece of String runners” on the way and were greeted by Ryan and Nicole dressed up in Santa outfits (amongst the other volunteers) who were manning the aid station. I checked in and checked out quite quickly and headed back to Streatley. I arrived back at Streatley, checked in and checked out quite quickly and started on the repeat of the first leg. With the out and back legs, it was good to see other runners out on the course and give a little acknowledgement. It was also interesting to see the lead runners performing (something which I don’t normally see!) and noted how they were relentless in their desire to keep running and to keep pushing forward. The rain was still at a steady downpour as I repeated the same leg again and once again headed out on the same route towards Wallingford and back again. The only points I recall was that it was still raining and unfortunately I managed to take a slight diversion on the way back which added an extra mile to my journey. It was a silly little mistake as I had been rummaging around in my backpack for some snacks as I followed the path ahead when I got to a hill and a road junction I thought, “this isn’t right” and headed back the same way. When I got back onto the right path I saw a runner head left and another runner head right as people were heading out and back in both directions. I did pause for a moment thinking should I go left or right but then tagged along with a couple of runners (Mark and someone else) who were heading back to Streatley. At that time, I felt like a bit of a fool for making a silly mistake especially as I had recce’d the route and there was an instant desire to up the pace to make up for lost time which was pretty pointless as I still had 80 miles to go. I caught up with Allan Rumbles who had wondered how I managed to get slightly ahead and then slightly behind him and we spent a bit of time running and chatting as we headed back to Streatley which marked the completion of the first 25 mile leg although in reality it was longer by 2.5 miles or so due to the course diversions. I didn’t tarry too long at Streatley and headed back out to the Ridgeway leg (leg 3) which we were now going to repeat twice. I was running by myself for a bit but saw the occasional runner as people were coming back from the opposite direction. Heading through the covered Grims Ditch area meant it was now started to get darker and with floor covered in leaves and a lot of exposed tree roots I thought it prudent to get my backup hand-torch to give me a clearer view of the footing ahead. A short while later I bumped into Mark again who was tracking another chap. Unfortunately, Mark had left his head torch in his kitbag at Streatley by mistake and was tailgating the chap ahead. We chatted briefly for a few minutes before I realised I had my head-torch and lent Mark my hand torch whilst I dug out the head torch (the benefits of carrying mandatory kit) and we both plodded together to the checkpoint. It was still continuing to raining as it had been for several hours now. This part of the route saw the Ridgeway route go through two large fields which I can only describe as quagmire. Unfortunately, we had to go through this there and back and repeat this a second time, nice. When we got to the checkpoint, we spotted Anthony Low there who had been at the checkpoint for a while and I think had decided to call it a day there. On the return leg I had decided to have a major stop at Streatley to change my socks and put on some dry kit for the night leg. My waterproof had kept my body dry but my clothes were damp through sweat and I felt better about having some hot food, dry clothes and checking my feet which were completely soaked but the Drymax socks I had did seem to drain the water out of the sock. I bumped into Jerry Smallwood and Gemma who were sweeping this section and said a quick hello before continuing on. At some stage I hooked up with Allan and Wendy again somewhere along this leg and we arrived at the checkpoint at the similar sort of time. Wendy immediately headed out again as she had decided to get another leg completed before a kit review/sock change whilst Allan and I had some hot food and changed some clothes. This was probably my longest stop (perhaps 25 mins) but I felt better after a stop and I headed out with Allan following a few minutes later who was going to catch me up for the company. I started walking at first to allow Allan to catch me up but as this first section was the most runnable I decided to run a bit more. Allan caught me up a few miles later and we headed along the route together. A little while later we were heading towards the Grims Ditch area and I was starting to feel a little unwell. A little while later I stopped to throw up. Allan who was a few yards ahead kindly asked if I was ok… as he ran off in the distance, thanks mate! I slowed to a walk and trudged into the next checkpoint. I fell over once and ripped my leggings aswell. Wendy passed me on her return leg at some point here. I was still feeling unwell and starting to feel some early signs of hypothermia, my teeth were chattering uncontrollably, my hands were shaking and I was starting to feel really cold. I knew I would have to sort myself out at the checkpoint if I was going to have a chance of finishing this event. I think Mark caught up with me as we got to the checkpoint close to each other. I had a few hot drinks, ate some biscuits and fruit (which thankfully stayed down) and took out my spare fleece from my pack and put this on (again another reason why you carry mandatory kit). I then decided to start heading back after a few minutes as I didn’t want to stop moving for too long and get too cold. I asked Mark if he was heading back but he decided to take a bit longer at the checkpoint. I pretty much walked the rest of the route back to Streatley which was slow going. It was still raining, my feet were soaked again. On a more positive note I felt a little better up with the aid station refreshments and an extra layer and now had the shivers under control although I wasn’t up for much running to be honest. The rain, well it was relentless. On my way back, I managed to take the same slight detour again but quickly realised this and only went the wrong way for a few hundred yards this time before turning round. Mentally, I was flagging. My surface thoughts were all about stopping or hoping that the race would be called off so I could stop without having to quit but deeper down I knew I would carry on. On the approach to a few of the checkpoints, I would focus on a little mantra of tasks I would complete at the checkpoint (food, water, socks, batteries, food, water, socks, batteries) to keep the mind active. At the North Stoke aid station I was recognised as “Batman or was it Robin?” (as the conversation went) and John Whittaker kindly emailed me a photo he had taken of us about 70 miles into the TP100. I also bumped into Jerry Smallwood again who had traded in his sweeping buddy Gemma for another partner. I don’t think I was quite as “chipper” as the first time I saw him! I got back to Streatley around 2.30 – 3.00am where Stouty was going to meet me and pace (plod) with me for the last leg. I changed clothes once again and had some soup and chatted with a couple of guys at the aid station. I didn’t want to make too much fuss about feeling unwell as there was a slight fear I would get pulled out of the race. After a few words of warning from James Elson about how windy and exposed the last Ridgeway leg would be and after putting on fresh clothes (about 4 layers), Stouty and I headed out for the final leg. I wasn’t feeling great and knew this was going to be a steady march to the end. It was frustrating that 25 miles was going to take me 6-7 hours and my thoughts were all pretty grim at that point. It was still raining as it had been for the past 17 hours or so but as we got onto the Ridgeway the rain was replaced by a ferocious wind right in the face which buffeted and battered us as we trudged along the Ridgeway path. The Centurion team had laid out an extra aid station about 6 miles into this leg in view of the conditions but I preferred to carry on and not waste time if at all possible. We arrived at the next aid station about 8 miles into this leg where James Adams was waiting for Sam Robson to finish the “Piece of String” fun run. Sam had been running since midnight the previous night and his journey would be over soon. Fantastic achievement Sam (and Wouter who had already finished), well done and sorry I didn’t catch you on the day. After sitting in the back of the van which acted as the aid station, the strength of the winds was apparent as the van was being rocked by the winds. I had a couple of cups of tea and some biscuits and then left the checkpoint with Stouty. Walked 50 yards and then threw up again, the wind kindly sprayed the contents of my stomach well away from me and I stood hunched over for a minute or two regurgitating those teas before Stouty persuaded me to go back to the van and sit down for a few minutes which I did. I drank a bottle of water and sat in the van for a minute as another runner and pacer arrived, the runner was looking really cold and shivering and I recall two thoughts; “get moving or you will get cold” and “put on a brave face as you don’t want to be pulled out here at the 83 mile checkpoint”. So after a couple of minutes stop, a “quick yes, I’m ok” to the marshals and then Stouty and I trudged on. My sleepy phase started to hit me around now and I clung onto Stoutys waist pack a few times to keep myself from dropping off as we plodded the next 4 miles to the checkpoint at the outward spur. Half way there and we saw Wendy and her pacer Kerry on their way back, Wendy was looking cold but determined and was on course for a top 10 finish overall and 2nd lady so despite the conditions was doing really well. We continued on with both Stouty and I slipping over several times in the mud and puddles before we got near the furthest checkpoint and saw Allan Rumbles heading back. We eventually made it to the checkpoint, turned and headed straight back. The wind was thankfully blowing against our backs and pushing us home, only 12.5 miles to go and this will finally all be over. It started to get light on the way back, the wind died down and the sun came out, it was still pretty cool in the morning but the weather had totally transformed from the previous day and night. Stouty and I continued past the next “van” checkpoint and trekked the final 8 miles back. I had one further moment with about 5 miles to go when I thought I was going to throw up again but managed to hold it in as Stouty kindly whipped out his phone to take a picture (we nearly had a 2013 Piece of String entry photo just there!). We continued to pass several runners who were on their out and I felt for the people who still had a few more hours to go but at least the weather had improved making it more bearable. All I was thinking about to that point was getting back to the finish, getting warm, having something to eat, a nice soak in the bath and some sleep. We were getting close to a 24 hour finish based on the time (my Garmin had run out of power after about 18-19 hours) but I was having these thoughts that I didn’t really deserve a sub 24 hour finish or the buckle as I hadn’t run enough in the second half of the race. I thought to myself if we make it, we make, if we don’t then we don’t. Chatting with Stouty, I was in that mentally weakened state (or is it an honest appraisal?) where I was contemplating revising my race schedule for 2013 and avoiding the long long runs. However as we got closer I knew I would be gutted to miss out by a few minutes and so with about 2 miles to go I forced myself to run in little spurts. Thankfully, the last mile or two is downhill but with a bit of encouragement from Stouty I plodded towards the finish at the Morrell room. I entered the room to be greeted by a few familiar faces. Wendy and Allan were both there (Allan with his Grand Slam buckle, well done!) and Wendy had indeed finished 2nd lady and 8th overall I think. James gave me a well done and handed me the Centurion buckle and technical and t-shirt. How did I feel? Relief! No disrespect intended to James and the Centurion team (including all the volunteers) who did a fantastic job in getting the race on and for some great support at the aid stations but it was one of my most miserable race experiences! Physically, my feet were really sore, my legs didn’t feel too bad but my stomach as all over the place. I couldn’t face anything to eat or drink at the finish. Following a tough old slog at Caesars Camp 5 weeks ago, I felt a real lack of enjoyment as the event turned into another battle to finish from the halfway point and I felt a sense of disappointment that more of an effort wasn’t made in the second half of the race. Looking back at my races in 2012, I’ve run the Thames Path 100 (heavy rain), Wales trek (rain and mud), Run 24 (the exception), Ridgeway (storms and rain), Caesars Camp (rain and mud) and Winter 100 (rain, mud and strong winds). It’s been a pretty miserable year running wise with my longer races being the most challenging. The final result was a finish in 23.48 in 16th place out of 31 finishers so another consistent mid-pack position although I have to say at no point did I think I was in a race or racing at all (a lack of pressure from being a comfortable mid-pack runner perhaps?). Unfortunately there were 44 DNF’s which would have largely been down to the weather which was relentless. Finally, a few acknowledgements in no particular order. James & the Centurion Team – fantastic organisation to get the race on and working around the necessary course amendments and great support during the event. I did notice the effort the team went to during the event to make things easier (marking the North Stoke aid station with tape to make it more visible following a couple of comments from people saying they missed it, sending out the guys on the last Ridgeway leg to set up an ad-hoc aid station etc). Top class events and well recommended. The volunteers – Amazing support, enthusiastic, energetic and very supportive even after hours and hours of standing around in the wind and rain. It’s great to see more and more familiar faces at these events, which creates a great community atmosphere. I really enjoy the race day support and atmosphere. The runners – well done to everyone who towed the start line but particularly Allan Rumbles (who I ran with for quite a bit) and Tremayne Cowdry (who kept I crossing numerous times) on getting their Grand Slam awards. Well done to Ken and Andrew who were the other two Grand Slam finishers. Fellow Reading Jogger Wendy Shaw also had a great run to come 2nd lady, superb effort! Special mention to the Piece of String runners aswell, tough, tough event. Finally, my running (walking) buddy Stouty for meeting me at 3am and getting me home on the final leg as I was slowly disintegrating in front of him. I probably would have slogged it out solo but he made it a bit more bearable on the last leg. Thanks mate. Final thoughts and a couple of questions. * Having a decent waterproof top was essential. * The importance of carrying mandatory kit in races this time of year was apparent. The use of the spare hand-torch and fleece was evidence of that. * Try not to hang around at checkpoints but if you have to then have a purpose or a list of things to do and then go. There were a few people who started to settle into checkpoints and then found they had even less desire to carry on. * There were some seriously powerful head-torches in use. If anyone wants to let me know which ones they were using then please do so. My £8 bargain head torch was pretty bright but absolutely tore through several sets of batteries so I’m thinking of investing in something more energy efficient. There were also a couple of guys with some sort of chest light which looked good aswell. * Trainers, my feet were really sore. I would be interested in hearing people’s recommendations for trainers that are durable in wintry conditions but give the feet a bit more comfort from the miles and miles of running. Finally, that’s my race season over for 2012. I just have a silly target of 3,000 miles to complete (on 2,738 after the Winter 100) and that’s me done for the year. Thanks to Kerry Aylmer for the pre-race photo. Sorry to say that I didn’t take any pictures or videos during the race because of the constant rain. Sorry to any YouTube fans out there. Sorry to hear that your race was so tough Paul. It was really tough out there, particularly that section on the Ridgeway running against the wind! Awesome work on pushing to the end though. I must have just missed you guys on your return leg – I might have been getting lost down in Compton as you ran past! In terms of head torches, I use the Petzl Tikka Plus 2 which is not too bad. It's pretty good considering how light it is and isn't too expensive. Alternatively, the Lenser H14 is a good one if you want something über bright. I wear a second one on my waist which might have been what you saw others doing. I find it helps on cold nights when your breath causes the light from your head torch to reflect back. Roll on a dry 2013! Great write up – it was really tough out there. The rain was ok to deal with but the wind was awful. I was the runner you mentioned in the van at 83. I had to pull out after getting far too cold! !Well done for getting sub 24 – amazing! Thanks for the comments guys. Sam – Other people have recommended the Lenser H14 aswell which I will check out.Mary – Sorry to hear you had to pull out so close to the end and having endured so much already. Great write-up, Paul. Hope you find a dry and sunny race next year! I was using a Silva x-trail, (http://silva.se/product-family/x-trail), it was definitely bright enough. Downside is the price and that you need a battery plan. That is, you need several batteries (lithium) which are really expensive. The AA-option is cheaper but seems to be less bright..